NAD: I THINK i FINALLY FOUND IT!!! Re: NAD: I THINK i FINALLY FOUND IT!!! I picked up a pair of 16 ohm on the cheap so if I start to detect the speaker is getting pushed too hard, I'll swap them out for 16 ohm and hope the wattage hit won't kill the headroom. If I do find a K100, or redback on the cheap locally I might have to check one of those guys out as well. I'm also working on a stereo 212 so I can always swap to that cab if I need to and keep the PortCity in the original configuration. In all honestly I think I'll be fine. IME most class D amps are over rated power wise. In perfect power conditions with max gain sure it might be pushing the 85 watts but I keep going back to the RV50MKii112 combo. I have no idea how a single V30 kept from exploding in that combo since we all know the RV series can really get pretty spicy watt wise at stage volumes. I checked the manual but didn't see any max power figures. I'll let ya know if I see any smoke! From your preliminary testing, it's very likely you've found your dream rig. You said it only gets a little harsh when it's louder than you expect to play regularly. But the point of the internet is to keep people dissatisfied and encourage them to keep buying stuff. and encourage them to keep buying stuff. I know my RV50 is meant to be capable of 90w peak power........ 50w rms. Most speaker manufacturers list the maximum power their speakers can withstand. That lets them give a numerically high, impressive power rating. But that leaves it up to educated consumers to understand that tube amps' wattage is rated at low distortion levels and that cranked up distorted amps actually put out quite a bit more than their rated wattage. Celestion don't play that. "15 watts" means it's safe with any 15 watt tube amp cranked all the way up. 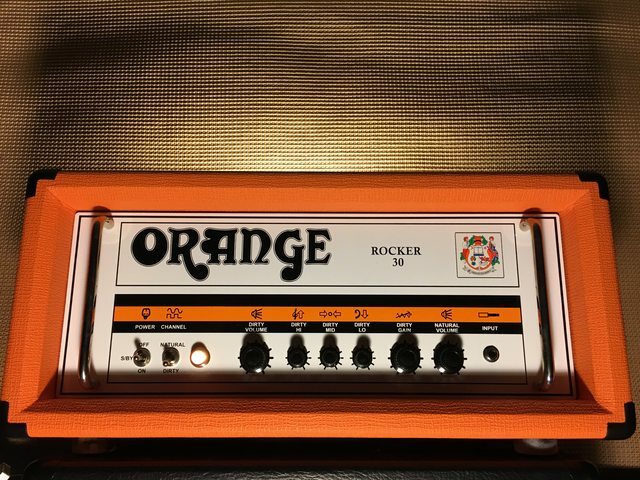 A V30 can handle any cranked 60 watt tube amp. Fender did a run of the 20W Deluxe Reverb loaded with a 15W Alnico Blue. They wouldn't have done that if they were worried about warranty claims for expensive fried speakers. Mesa often uses a single MC90 with 100W tube amps. On top of that, those other companies rate their speakers with a clean, steady-state, pure sine wave. No harmonics, no distortion. Celestion factors in how much harder a compressed complex signal works a speaker. So we've been conditioned to not trust power rating. With most manufacturers, to handle a tube amp in the real world, you have to buy speakers rated higher than the amp. But some companies like Celestion and ElectroVoice do conservative, "what you see is what you'll get" ratings. Oh yes, the saga continues. So I stumbled across this on Kijiji and messaged the guy for more info. Said a friend of his did the conversion and kept the original cab and speaker as payment or something fishy like that. I will say it's not the move beautiful cab but I have full intentions to either rebuild it with some nice figured wood, or cover this monstrosity in tolex. A design alteration may also be required as I know the tubes are much too close to the wood (paint starts to stink as the tubes heat up, also who spends time doing nice dove tails them paints over in black gloss? Horrifying). It's a hotrod deluxe complete with the tank. This is almost exactly what I've been looking for tone wise. I'll never use the gain channel and it's a bit larger than I initially wanted, but not a huge deal. Super light though. With the volume at 2, it's too loud for my office and crystal clear. Seriously a massive tone! Had to back the bass almost all the way off to get it matching the bass response of the TT. It simply sounds huge through the single 12 in my PC cab. Sorry PS170, you have been bumped off for now. Sounds cool, but man is it ugly haha. It's funny though, when I tried out the combos they had next to no headroom. This must be one of the older models built before they started introducing earlier breakup. It's not as sparkly as I remember them sounding back in the past but the guy says he has had it forever and never touched the tubes. It's got grooves in it, so some JJ's should really add a nice clarity and chime. I'm happy for the moment. Thanks for listening. Have you ever tried a quilter amp for what you are looking for? Big sounding cleans, just curious as to your thoughts. Well this will be my final post in the clean headroom saga. I'm working on unloading a mountain of gear since moving into our new place. Been disgusted with myself and how much crap I've accumulated, not to mention the money I've wasted. If something hasn't sparked joy! It's outta here! Anyway. I've been eyeballing new speakers to test out and for the first time, thought about how much money I would be wasting towards something so silly. I decided to bring the TT rig out into the main basement area (no the cats haven't ruined touched the grill cloth. Relieved. Still won't risk the Orange cab out in the open yet). This means I can finally use my L1 as the clean amp. Few hours of jamming later I was sold. In the event this project exits the basement my clean signal will into a DI then into the house system. Heck I might even use the Bose T1 mixer as a live preamp/DI. Nice to have everything in one spot. Please make sure to enjoy all of your gear before you become a jaded musician and realise you have wasted a mountain of money. Yea I was digging that for a few minutes for sure. My issue was never the amp it was the speakers. I quite prefer a tweeter on my clean tone. The new F12-X200 was going to be my speaker of choice but have no need now that I'm into the Bose.